Dan Hallett’s strike on Saturday saw a historic day in Alfold’s history marked with a landmark success. 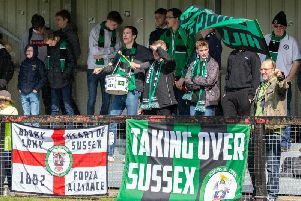 They ran out 1-0 winners against Bexhill United - a side, amongst a couple of others, being tipped for the title due to the impressive signings this summer - in what was their first-ever game in senior football. There were a number of fouls committed in the opening stages and from one such infringement led to the opening goal on 16 minutes. Hallett was fouled from behind outside the area and Lee Wragg took a quick free kick which saw Hallett strike a half volley on the turn which flew into the bottom corner. Bexhill had a five-minute spell in which they had more of the ball, but apart from a disallowed goal which was ruled out due to a hand ball from a United forward, it was a comfortable half for Alfold stopper Luis Correia. In the second half, it took ten minutes for Alfold to get going again as the resolute defence stood strong - marshalled by new signing Jack Stafford. Bexhill pressed and pressed but could not find a way through the strong back four. On 70 minutes, Sam Lemon found himself inside the area and his curling effory was denied by a great save from the ‘keeper, before Hallett smashed his volley high and wide. With the clock running down, ‘Fold captain Kieron Purkis rallied the players to keep digging in through the hot conditions. A couple of attacks from Bexhill late on threatened, only for Gavin Fowler to snuff out both attempts as they saw out seven added minutes. Joint-manager Jack Munday said: ‘It was the most professional performance I’ve seen since taking over here last season, every single person involved on and off the pitch should be proud. Alfold take on Storrington at home in the Peter Bentley Cup this Saturday. Alfold: Correia, Sultan, Gray, Fowler, Stafford, Lemon, Bevan, Wragg, Nourse, Hallett, Purkis. Subs: Moutian, Pett, Wanstall, Goodman (Unused).